High efficiency condensing boilers deliver comfort, convenience and reliability. They provide whole-home heating and, when you choose a combination boiler, can also offer water heating in a single advanced system. This smart system delivers comforting warmth as well as enduring quality and lasting peace of mind. 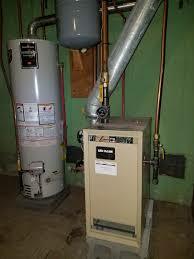 Master Plumbing & Mechanical installs and services boiler systems, specializing in high-efficiency condensing boilers. Traditional heating systems waste energy and send your warmth and comfort into the atmosphere. A high-efficiency condensing gas boiler retrieves heat energy from the flue and redirects it to the heat exchanger for increased efficiency and lower energy costs. High-efficiency condensing gas boilers also save energy through energy-smart performance technology that produces consistent heat from a modulating gas valve that detects the smallest temperature change. In addition, these units have many venting options available, which can lower the cost of installation. Beyond energy conservation, high-efficiency condensing boilers also offer consistent heat throughout the entire house and pleasant humidity levels and continuous. A combination boiler adds even more efficiency to your home, both in energy usage and space requirements. 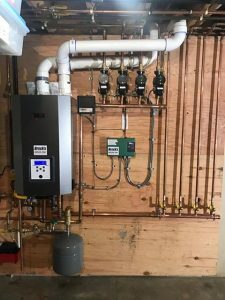 Providing both central heat and hot water to your entire home in a single, highly-efficient system, combination boilers can save a considerable amount of energy, and take up far less room than a separate boiler and hot water heater. We also install non condensing cast iron boilers that are 83% efficient. These boilers will replace your existing boiler in the same location. Triangle Tube has six condensing boilers in their model listing. They offer both direct and indirect units that provide an abundance of hot water and are highly efficient in their use of fuel. All of Triangle Tube’s high-efficiency condensing boiler units offer reliability and cost savings as well as space-saving capabilities. Weil-McLain has been the standard-bearer in boilers for many years. Their boilers are high quality and at the cutting edge of this industry. The company has a commitment to creating simple solutions for a complex world. The hydronic boilers that Weil-McLain produces include the newest in technology and materials for cast iron, stainless steel and aluminum heat exchangers. These boilers are both dependable and economical, which contributes to the company status placing Weil-McLain at the pinnacle of this industry. Customers who purchase their boilers and indirect-fired water heaters are also buying value with built-in peace of mind. Master Plumbing & Mechanical services the Washington, D.C. metropolitan area. Contact us for more information about boiler installation and repair.